Last week when I went to the farmer’s market I was lucky enough to score 14 pounds of peaches for $10 which I used to make spiced peach jam and peach pie filling. This week when I went I noticed a few very large baskets of tomatoes for sale. The basket ended up containing 19 pounds of tomatoes and cost a mere $10. I couldn’t wait to get them home and get canning. 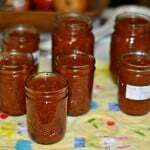 Last year the most popular thing I canned was salsa. We ended up eating almost all the jars before the spring. 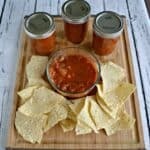 I had canned mild, medium, and hot last year but somehow I only ended up blogging about the mild salsa. Our favorite was the medium salsa. 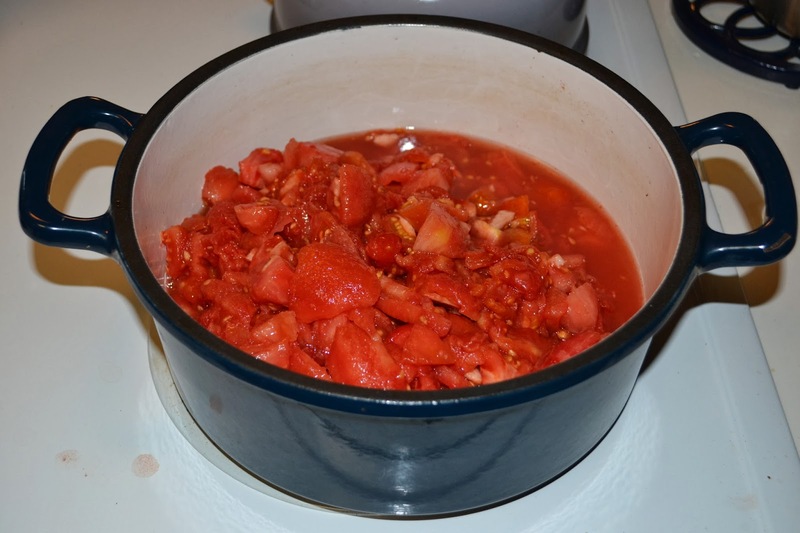 It is full of fresh tomatoes, green peppers, onions, and some heat from hot peppers. 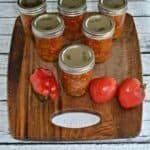 While I found some of the tomatoes I bought to not be suitable for canning, most of them were and this salsa turned out quickly. 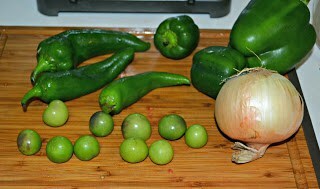 I also had about a pound of tomatillos from our CSA. As a brief side note, make sure you wear gloves when cutting the hot peppers as they seriously burn. I touched one before putting my gloves on and then scratched my nose-bad move! It felt like it was on fire for over an hour. The salsa turned out just as well as it did last year. 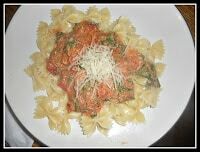 It has a rich red color and is packed with fresh vegetable flavor. The heat from the hot peppers comes through in the end and while it doesn’t burn your mouth, the heat is definitely there. 2. In a large saucepan combine all the ingredients. Bring to a boil over medium-high heat, stirring constantly. Reduce the heat to low and boil gently, stirring frequently, for 30 minutes. 3. Ladle the hot salsa into hot pint jars. Leave 1/2 inch of headspace. Remove the air bubbles and adjust the headspace. Wipe the rim and place the lid on the jar. Place the screwband on and tighten to fingertip tight. 5. Remove from heat and remove the lid. Let sit for 5 minutes. Remove the salsa from the canner and let them cool for 24 hours. Check the seals and then store for up to 1 year. « 75+ Recipes for Thanksgiving! Chips and salsa are my biggest craving. 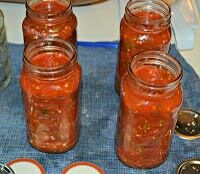 Once I crack a jar of salsa open I can’t stop. This is crave worthy! 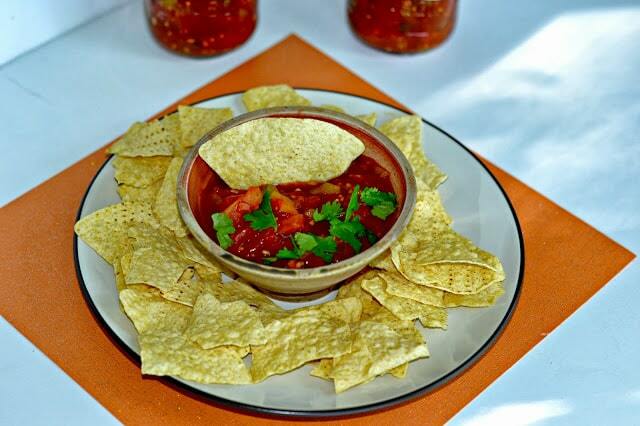 Love love love homemade salsa. I have been wanting to can salsa forever! Thanks for the recipe, now I think I can work up the courage to finally do it.